Wikipedia founder Jimmy Wales talks exclusively to IP’s Rob Green about the search for trusted information and the role of libraries and librarians in the face of the rise of fake news, clickbait and the erosion of trust in news and information sources. When Wikipedia was launched in 2001, we were living in a very different world. Mobile phones were still largely speaking and texting devices. It would be a full six years before the -notion of a smartphone gained traction with -consumers, following the release of the first iPhone. Today’s connected generation take fingertip computing power for granted, and have instant access to information and data from across the internet. Anyone with a connected device not only -consumes data, they curate it and create it – constantly adding to the deluge of data and information available. Huge chunks of that information is benign, but the ease with which it can be created and accessed means it has become simple to manipulate and distort the truth. Jimmy says that how people judge this proliferation of information needs to be addressed – and points to libraries and librarians as the facilitators to improve skills. Jimmy says: “One of the things we know about medical literature is that studies get published with findings that are intriguing and interesting – but maybe it’s a study of 20 people that shows an ­unusual result. Now, medical professionals know to say, ‘that’s interesting, we should do some more studies and find out more’. After a few more years of research and some meta-analysis we find that that is an unusual outlier. “But it’s quite easy for a person, particularly if they are ill and vulnerable, to read something and take it at face value. There are tons of people who can take that kind of information in the wrong context”. Wikipedia has been running its ­#1Lib1Ref campaign for a number of years, asking librarians to become Wikimedians and add their own pages or edit existing ones. 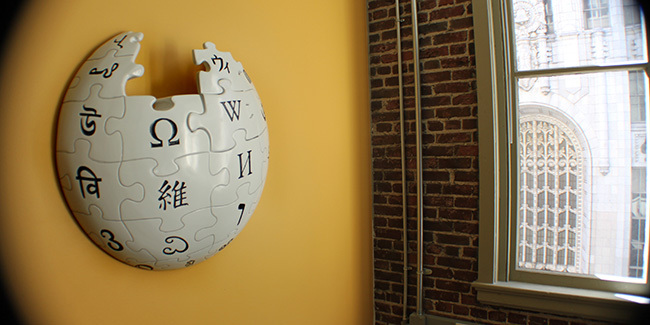 The aim is not just about getting more trusted contributors to update pages (although that inherent trust in the profession is one reason why the campaign is aimed at librarians), but also to help libraries make more of their collections by making them discoverable through to the Wikipedia community. It is clear that the value of libraries and librarians is not lost on Jimmy and he sees the potential for the profession to become the facilitators for improving information literacy understanding and skills in local communities. He says that while individuals within the profession, and the profession as whole, already understand how they can help, there are constraints because decision-makers do not have the same grasp. This leads to a scenario where librarians are undervalued and misunderstood. Having said that he believes that things can be changed, and it could be the rise of fake news that helps force the change. The traditional news media has seen an opportunity to regain some of its lost trust by focussing on fake news and trying to tackle it. The idea that fake news is real and potentially dangerous to society is now part of the media agenda as they look to regain readers, regain trust and ultimately regain advertising revenue. For librarians there is an opportunity to be at the forefront of that agenda. Librarians are already widely trusted and well-placed in local communities, with a genuine public service ethos. Summing up the rise of fake news, Jimmy says it has stemmed from an over reliance on cheap-to-produce content which has undermined professional journalism. He said: “What has changed a lot is the business models. The advertising-only model has been incredibly destructive for journalism. It leads even quality publications to feel a financial pressure to go for clickbait – vast amounts of low quality content. Rather than go for long-form, good quality, well-researched pieces which are expensive to produce and require a certain degree of professionalism. That skewing of news provision has devalued the concept of news, and has allowed the growth of fake news (or lies) to take hold. Jimmy cites Hannah Arend’s treatise on fascism and totalitarianism in which she views the first step on the road to tyranny, not as indoctrination in a belief system but to undermine people’s belief in anything at all. Jimmy does see some positives in the way news organisations are looking at different business models, from the Guardian’s supporters model – one he pushed for during his time on the paper’s board, and which he has since adopted with the launch of WikiTribune; and The New York Times’ push for digital subscriptions, which has seen a rise in paying-users from one million to more than three million in just a couple of years. He says: “That is huge because revenue from readers really is the incentive to produce content that is meaningful and can be used to change lives in a meaningful way. While the rise of fake news has not hampered Wikipedia, according to Jimmy, he is worried that the general public are at a disadvantage. He says: “The ­phenomenon of true fake news – websites set up to spread viral content that has no discernible truthful element to it and has no concern for the truth whatsoever – has had no impact on Wikipedia. That’s because the kind of people who become Wikipedia volunteers and who become experienced, spend their lives judging sources. To fool a Wikipedian with ‘Pope endorses Trump’, they are going to say ‘hold on a second, that doesn’t sound right’. That kind of skill is not rocket science and I think most people who are avid consumers of news or information gain those skills and learn those skills quite readily. But they need to be taught more widely – it’s crucially important. Looking at the digital transformation that is happening in the world, there are parallels in the shift to digital between news production and libraries. Both are born from a paper and ink world and both are having to find their places in an electronic world. The media is slowly finding its place in that world and is continuing to experiment and innovate. Jimmy says the same must be true of libraries and librarians, who he sees as guides to information, knowledge and the skills needed to navigate the digital information sphere. He said: “One of the things I think is really interesting about libraries and librarians is the challenge of technology. I don’t think we should be looking at the meaning of the word library in the future as effectively a museum for old ­objects, with paper in them. That is kind of a dead idea of what a library is. Fundamentally, that is not what a library is. “A library 50 years ago was a living and breathing place that happened to be full of books because that was the most efficient way of getting and storing information. Now books are still, in many cases, the most effective ways of getting and storing information – but not in all cases.